Cacao powder is a product obtained by means of milling cacao press cake which in its turn results from cacao oil extraction from micronized cacao mass (cacao liquor). This product not only improves the appearance and flavor of the finished product, but also has high alimentary value. Cacao powder as an ingredient has been widely outspread in the confectionery, bakery and milk industries. 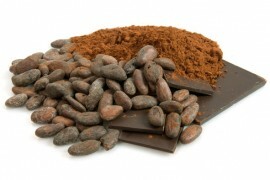 Natural cacao powder is obtained from grated cacao which hasn’t been treated with alkali. Such powder has subacidic reactivity. It is appropriate to use the product for manufacturing of a wide range of chocolate products and icings, as well as fillings for candies and waffle layers, chocolate margarine and butter, ice cream, flour and confectionery products. Prepacking 0,5 kg, 1 kg, 5 kg.